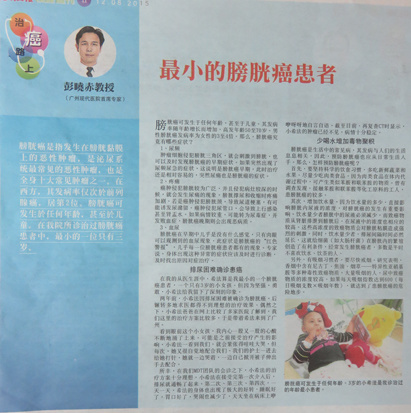 On August 12th, 2015, Guang Ming Daily in Malaysia reported an anticancer story of a three-year-old girl, DAMARA SYIFA ADISTYA JALADRY, who was diagnosed with bladder cancer. After taking four sessions of Pro. Peng from Modern Cancer Hospital Guangzhou introduced that bladder cancer was the most common malignant tumors in urinary system and also one of the top ten common tumors in the body. People at any age possibly have bladder cancer, even the children. Pro. Peng told us that DAMARA SYIFA ADISTYA JALADRY was the youngest bladder cancer patient during his physician career. Though she was three years old, she was strong and brave. Two years ago, DAMARA SYIFA ADISTYA JALADRY was diagnosed with bladder cancer with the symptom of difficult urination. She looked for many doctors but did not get a good therapeutic effect. By accident, her father found Modern Cancer Hospital Guangzhou on the Internet. Comparing with other cancer hospitals, he decided to go to Modern Cancer Hospital Guangzhou for it had many therapeutic regimens. May being affected by the affects of the treatment before, once seeing a doctor or nurse, she cried sadly but she still cooperated with the treatment. For example, when the nurse went into the ward, she cried sadly but she still put away the sheet and stretched out her hand to the nurse. Everyone saw this scene, they all felt sympathy to her. Luckily, the therapeutic effect was good under the consultation and treatment of MDT (Multidisplinary Team) in Modern Cancer Hospital Guangzhou. After the first session of interventional therapy, DAMARA SYIFA ADISTYA JALADRY had smooth urination. Continuously taking the subsequent treatments, her body turned much better, with better sleeping quality, better appetite, and better mental status. She always happily sat on the bed, playing and talking. Now, the result of CT scan showed that her tumor was gone and the condition was stable. Pro. Peng reminded that prevention of bladder cancer needed to start from daily life. Firstly, people needed to keep on a healthy diet, eating more vegetable and fruit and less meat. Secondly, drinking more water was also important. Additionally, the smokers needed to get rid of smoking as soon as possible.